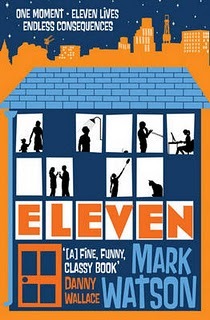 Wicked Wonderful Words: Review: "Eleven"
I really can't remember how "Eleven" by Mark Watson ended up on my TBR list. Don't misunderstand me, I am glad it did, it is a good read but it is just not the kind of book that I would normally pick up. I must have read a review of it somewhere and decided that it deserved a try. Anyway I took it with me when I went to London on a two-week vacation (I know, luxury! I am staying with my boyfriend so no expensive hotel bills but lots of great homecooked meals, the perfect vacation - now back to the review). "Eleven" is whimsical and its special trademark is that though it features one main character there are a bunch of minor characters and they are all essential to the plot. The minor characters are the story, really. However, first let me tell you about the main character with the strange name Xavier Ireland. This is not really Xavier's real name, he left that behind years ago when he moved from Australia to London to start a new life after a very traumatic event that I for spoiler-related reasons won't tell you about... So now he is Xavier, working in London as a nighttime radio host advising sleepless Londoners on everything from true love to the meaning of life (I know - quite a demanding job!). His colleague Murray is not only Xavier's producer but also his close friend who is constantly in need of help from Xavier and Xavier is there for him. Actually Xavier is quite a helpful guy, however, one day he walks past a bunch of boys bullying and beating up a boy but though he does try to stop it, he doesn't really do anything and definitely not enough. So the boy gets beaten up and from this event other events spiral that eventually lead back to Xavier. And then there is the speed date that Murray persuades Xavier to join him for and where Xavier doesn't find a date but instead finds a cleaning lady, Pippa. Pippa turns out to be a real power girl who takes over his life while cleaning his messy (...read: disgusting) flat and asking him questions about what actually happened in Australia so that the reader finally understands what has led Xavier to where he is in his life. "Eleven" is basically a book about domino effects - about how things that seem hardly noticeable in the end lead to big, life-changing events. It is slightly whimsical in the approach to fate and apparently (or so I've been told) it is reminiscent of "One Day" by David Nicholls. I quite liked this book though I have to say that I found it a bit on the light side. I would have liked to explore the characters of Xavier and Pippa more - especially Pippa because I really really liked her. She has this approach to life that if all she can be is a cleaning lady, then she is going to be the best cleaning lady that she can and I really like that about her and for me, it was Pippa who made the book. Read it if: You like philosophizing about why things happen or if you listen to a lot of night-time radio. I'm following. Have a great weekend! Hi! Thanks so much for following my blog. I am now following you!